What would the world be like, if all gifts and talents were shared equally. A Utopian world of matching talents… A world in which all spoke with the wit and eloquence of Oscar Wilde. All had the calm of Buddha. Could sing with voice of Aretha Franklin, Bjork, Kate Bush, or perhaps Elvis Presley, or Luciano Pavarotti, Frank Sinatra, or whichever singer you deem great…Could dance like Mikhail Baryshnikov, Mikhail Baryshnikov, Margot Fonteyn, Vaslav Nijinsky, Josephine Baker, Rudolf Nureyev or “Pina” Bausch. Could draw like Leonardo De Vinci or MichaelAngelo, or depending on your taste Picasso. Could run as fast as Usain Bolt. Have the brain Einstein. Write a piece of music as powerful as that of Carl Orff: Carmina Burana, or Tchaikovsky, Mahler and Brahms. I was really impressed by Amadeus, a film directed by Miloš Forman, written by Peter Shaffer. Two men (different ages) go down the same path, of being musicians. We can say that the Antonio Salieri character, is by most people’s standards a reasonably talented musician, the trouble is he has to coexist in a world of Mozart…this prodigy who has this natural talent and to put it crudely the “X factor”. Salieri is crushed into mediocrity by the looming shadow and pure talent and glaring genius of Mozart. In my story “Slashed” I write about two brothers. One is a genius painter (a Leonardo type figure) the other is rather like Salieri, left behind in the wake of his looming shadow. The genius brother is simply called “Maestro”. The brother Constanzi arrives by chance drunk at Maestro’s studio and forces his way in. 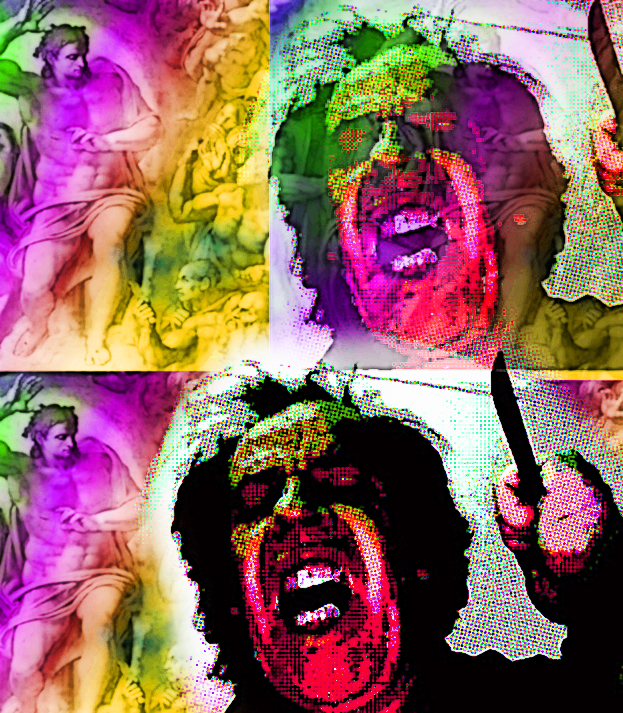 He is stunned by the brilliance of the work of his brother, which is about to be shipped off for a major exhibition, his brother’s name on the verge of being cemented in immortality… Constanzi then goes on a rampant wave of Art vandalism, pouring paint, dubbing graffiti…slashing works…It is not puerile vandalism…it is laced with revenge…but I also imagine him conducting himself like Jackson Pollock…there is elements of creativity…be it in a style that does not exist in the epoch the story is pertains to. The two brothers are both painters, but one has been given an incredible gift, the other the far lesser light is prone to be accused of living off the coat tails of his eminent brother and has little chance of flourishing, whatever he does. Constanzi’s destruction is a way of cleansing all the pain and hurt he has experienced over the years. Here is a short exert from the story…as Constanzi enters his brother’s studio. sacred space, leaving him feeling small and unimportant. Follow Francis H Powell on Twitter.